Having a fancy dish threaded with golden bird's nest may make most people's eyes shine, but not for 39-year-old Grace Chung. Instead, she would poke and prod at her food to make sure there is none of the prized delicacy hidden somewhere. Another person cannot exercise or exert himself within a few hours of eating shellfish. These allergies, while uncommon, can cause unpleasant and even serious reactions in some people. Last month, a 60-year-old woman who was allergic to prawns died after eating two pieces of prawn. She had anaphylaxis, a severe reaction in which the immune system releases a flood of chemicals that can cause one to go into shock. This causes the blood pressure to drop suddenly and the airways to narrow, possibly blocking breathing. A month before that, a three- year-old boy with a relatively common peanut allergy had to be given anti-allergy medication on board a Singapore Airlines flight. He was vomiting and could not speak properly when other passengers started opening their packets of peanuts that had been served as a snack. Though it is rare for a peanut allergy to be so serious, the incident is a reminder of how people's innocent actions can really hurt someone who has a serious food allergy. Most food allergies are caused by common products such as shellfish, milk, nuts and eggs. The best way to avoid an allergic reaction is to avoid these foods altogether. Here is a look at some of the less common allergies. Last year, Ms Grace Chung took a bite of a mooncake, saw streaks of white jelly in it, and spat it out. It was a good thing the chief operating officer of Gleneagles Hospital acted fast as she is allergic to bird's nest, a costly delicacy used in the mooncake. It has been 29 years since she tasted bird's nest at the age of 10. "Until now, every restaurant that I go to, I will ask if bird's nest is on the menu," she said. "I even asked the roadside stalls that I went to in Bangkok." When she first tried bird's nest, the premium item was not as common as now. "I got very excited and ate a whole bowl of it," said the 39-year-old. "Within five minutes, I felt breathless. I then had a choking feeling and was gasping for breath." Ms Chung, who had childhood asthma, thought it was a very severe asthma attack. Her mother took her to the nearest hospital, where the staff gave Ms Chung medication, pumped out the bird's nest from her body and put her on oxygen. It was not just her breathing that was affected. Her eyes were also swollen and she had rashes all over her body. Yet, within the year, Ms Chung ate bird's nest again as her mother wanted to be sure it was indeed the culprit. "Mum bought it from another shop and gave me just one teaspoon. I had a similar reaction," she said. "I thought I was going to die. My mum took me to hospital in a cab. She was crying." Ms Chung has since stayed away from bird's nest. Regarded as the caviar of the East, it is made of the saliva of the swallow-like swiftlet. Bird's nest allergies were once the most common cause of food-induced anaphylaxis in Singaporean children in the 1980s and 1990s, said Dr Elizabeth Tham, an associate consultant at the division of paediatric allergy, immunology and rheumatology at the National University Hospital. Although it is no longer the case now, people with the allergy are still seen regularly, doctors said. Those with suspected reactions should stop eating bird's nest and seek medical help immediately, said Dr Tham. "Patients with such allergies may develop swelling in the lips or eyes, hives and throat tightness, and have difficulty breathing or even faint." Dr Tham said there was an eight-year-old who went to the hospital's emergency department after eating a bowl of bird's nest. Within minutes of eating it, he had hives, swelling in the eyes and lips, as well as wheezing and difficulty in breathing. "He received an adrenaline injection and antihistamines and was admitted for observation," she said. A skin test later confirmed the allergy. Some people who have food allergy may occasionally test to see if they still react badly to a particular food "to try and allow their body to get used to it", said Dr Tham. "This is highly discouraged. 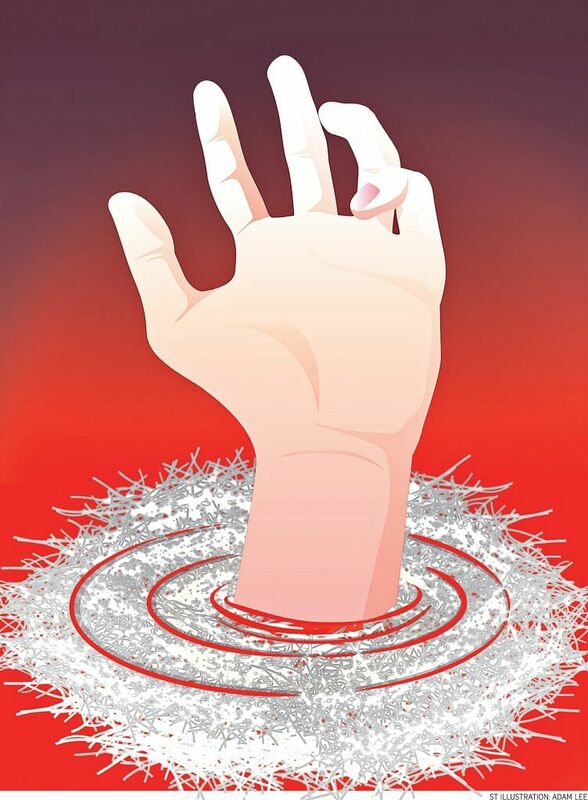 It is very dangerous and may lead to life-threatening reactions," she added. Call them real-life vampires but there are some people who dread daylight. A brief exposure to sunshine can trigger an itchy rash or worse. It is because they are allergic to sunlight and often have to slather sunblock on exposed skin, such as the forearms. They have to reapply the lotion throughout the day. Sun allergy is an immune reaction in the skin which affects sun- exposed skin such as that on the forearms and lower legs. • Polymorphous light eruption: An itchy skin rash which occurs within hours to a day of sun exposure. It is more common in females and occurs mostly in the first three decades of life. It usually subsides within a few days if the person avoids further sun exposure. Sunscreen and topical steroid creams can help. • Photoallergic eruption: A skin rash triggered by sun exposure to a chemical applied to the skin. This chemical can be found in fragrances, cosmetics or sunscreen; or in oral medications like antibiotics, diuretics and contraceptives. The reaction tends to show up a few days after sun exposure. The person should stop using the product with the chemical. Doctors may also prescribe topical steroid creams. • Solar urticaria: A rare condition that manifests as hives within a few minutes after exposure to sun or an artificial light source, most commonly in young women. The symptoms fade within a few hours but may recur on further sun exposure. The affected person is usually given oral antihistamines or topical steroids for more severe hives or, in extreme cases, phototherapy or anti-IgE treatment. Dr Chong Yong Yeow, a specialist in rheumatology and consultant at Raffles Internal Medicine Centre, said he has had a few patients with connective tissue diseases such as lupus. They had sensitive skin, mainly on the shoulder areas (sun- exposed areas) and chest wall. "The skin is red and itchy, but can be painful and have a rough surface," he said. 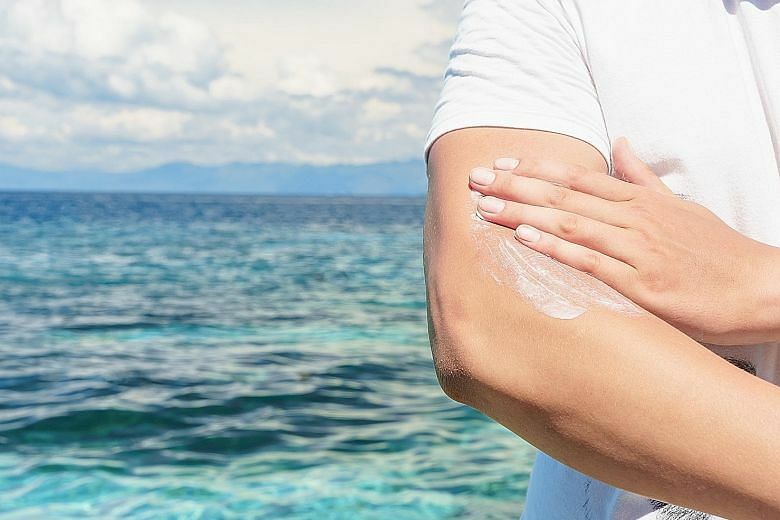 "Often, we have to differentiate between a rash due to lupus and the intake of certain medicines, which can predispose patients to sunlight sensitivity." One of the most common foods in the world - bread - can be poison to some people, if it contains wheat that they are allergic to. Kiwi fruit is another example of a well-known food item that some people can be allergic to. Eating a kiwi fruit can occasionally lead to tongue irritation, but the discomfort should resolve after a few hours. "However, some patients can have prolonged and severe symptoms after eating a small amount of kiwi fruit," said Dr Chong Yong Yeow, a specialist in rheumatology and consultant at Raffles Internal Medicine Centre. Such symptoms include tingling or swelling of the tongue, nausea and abdominal cramps. Those who have trouble breathing should get medical help, said Dr Chong. As kiwi fruit is more commonly used now - it is also used as toppings for fruit cakes, in fruit juices and smoothies as well as incorporated into cookies - those who are allergic to it have to be vigilant, he said. They may also react to latex, avocados, bananas, apples and carrots. Said Dr Adrian Chan, a consultant at the department of respiratory and critical care medicine at Singapore General Hospital: "Some proteins in latex are similar to food proteins, such as those in banana, kiwi and pineapple. People with latex allergy may also have cross-reactions to these foods." Someone with a pollen allergy could also get mouth and tongue irritation from eating kiwi fruit. This is called pollen-food allergy syndrome and it is postulated to be linked to similarities between allergens in pollen and kiwi. 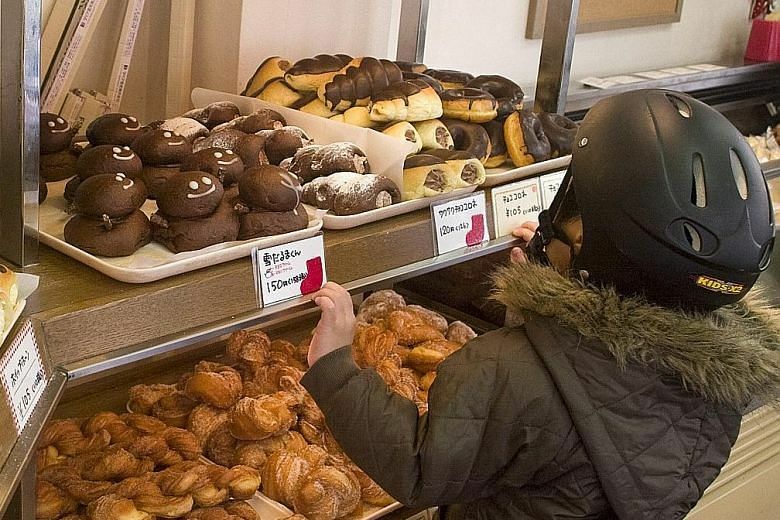 Meanwhile, wheat allergy mostly affects children, though about 65 per cent outgrow it by the time they are teenagers, said Dr Chong. People with this allergy are advised to avoid wheat but this can be quite challenging as it is found in a wide range of foods, he added. However, wheat allergy should not be confused with gluten sensitivity. People with celiac's disease would avoid gluten, which is found in wheat, rye and barley. "Unlike those with gluten sensiti- vity (also known as celiac disease), a person who has been diagnosed with wheat allergy must avoid eating food containing wheat as they can be prone to severe reactions," said Dr Chong. Wheat is also known to trigger food-dependent, exercise-induced anaphylaxis. Those with this variation of the allergy can eat food containing wheat, provided they do not physically exert themselves within four to six hours, said Dr Chong. An allergen that affects about two people here each year is galacto- oligosaccharide (GOS), a carbohydrate added as a prebiotic to commercial milk formula to promote the growth of good bacteria in the gut. Dr Elizabeth Tham, an associate consultant at the division of paediatric allergy, immunology and rheumatology at National University Hospital, said a man found out he had allergic rhinitis only when he took a sip of milk formula containing GOS that he had prepared for his child. He developed hives, swelling on the face and an itch in the throat within five minutes of consuming the milk formula, she said. A Health Ministry release on this allergy last year said that since 2007, about two cases of GOS allergies have been reported each year in Singapore. To date, there are no reported cases of infants below the age of two who are allergic to this substance. Those who have had allergic reactions developed swelling in the eyes and lips, throat tightness, hives, cough or wheezing after their first exposure to GOS, said Dr Tham. People who encounter adverse effects after consuming a GOS- containing product should seek medical attention immediately. Added Dr Tham: "They should not continue to expose themselves to the allergen to let their body 'get used to it'. This may induce more severe, life-threatening reactions." For a small group of people in Singapore, exercise is not something their doctor would recommend lightly. One example is 15-year-old Dan (not his real name), who was rushed to hospital two years ago with hives, facial swelling and tightness in the throat. He was also wheezing. He had never had an allergy to prawns, which was what he had eaten at dinner. Nor had he ever reacted badly to playing basketball, which was what he had done about half an hour after eating the prawns. Dr Elizabeth Tham, an associate consultant at the division of paediatric allergy, immunology and rheumatology at National University Hospital, realised that it was a combination of the two that had brought on the attack. Dan was diagnosed with food- dependent exercise-induced anaphylaxis. Dr Tham told him not to exercise two to four hours before or after eating shellfish. Dan followed her instructions and probably never had a reaction like that again. In food-dependent exercise- induced anaphylaxis - a subset of exercise-induced anaphylaxis - the reaction occurs only if physical activity takes place within a few hours of the intake of a specific food. In Asian patients, it is typically wheat or shellfish. Other foods like peanut, tomato, apple and corn have been reported in Western populations, said Dr Tham. Physical activity alone, or eating the food alone, does not cause anaphylaxis, she said. People with suspected exercise- induced anaphylaxis should seek medical attention immediately when symptoms appear and consult a doctor specialising in allergy for a definitive diagnosis. Occasionally, an exercise challenge test under a doctor's supervision might be indicated, she said. This is where a patient is put through physical activity while being monitored, in order to test his allergic reaction. It has been reported as a cause in 2 to 7 per cent of all patients with anaphylaxis in Britain, Europe and the United States, said Dr Tham. The prevalence in Singapore is unknown. "In many cases, the diagnosis may be missed or diagnosed as being idiopathic (no known cause)," she said. It occurs more often in adolescents and adults and rarely in children, she added. Symptoms may include hives and itchy skin, swelling in the eyes or mouth, difficulty in breathing or wheezing, and gastrointestinal symptoms like vomiting, abdominal pain and diarrhoea, she said. 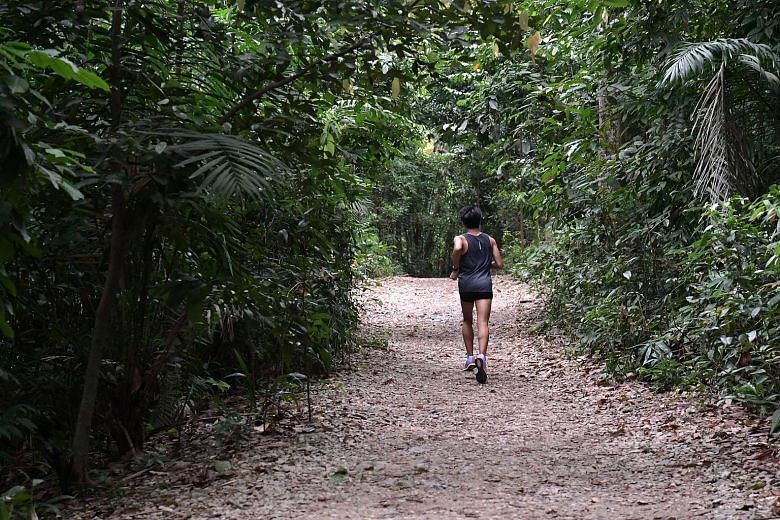 Dr Adrian Chan, a consultant in the respiratory and critical care medicine department at Singapore General Hospital, said allergic reactions following exercise may include swelling in the body, known as angioedema, or a drop in blood pressure, especially after vigorous physical activity. Exercise allergy is often difficult to diagnose as many people may experience similar symptoms during exercise and may put it down to the lack of fitness or an asthmatic attack, said Dr Tham. Exercise-induced anaphylactic attacks are also not always triggered by the same type or intensity of exercise each time. Eating certain foods and drinking alcohol, the temperature of the surroundings, drugs such as aspirin or non-steroidal anti-inflammatory medication, and hormonal changes can also affect a person's risk of developing such a reaction during exercise, she added.